There must be a way to get rid of pests without poisoning the environment. A good way...GOOD RIDDANCE! 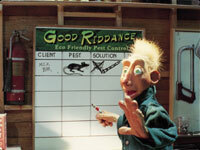 Created by Nick Hilligoss -- the brilliant clay animator of Turtle World and the other films in the acclaimed Bunch of Fives series -- GOOD RIDDANCE follows the exploits of Eco, the clean, green pest controller with a clever biological solution for every pest problem. But getting rid of pests the clean and green way isn't always easy; sometimes the solutions don't quite work out the way they should. But many times, if the problem is looked at in a new way, it can become part of the solution. This light-hearted look at thwarted good intentions reminds us that when looking for an ecological solution to a problem, it's good to remember that everything is related. Good Riddance: Termites - Eco combats a nest of termites that are dining on his home. "Recommended for school media centers serving grades 3 and higher. Public libraries might use this film when presenting a themed story hour."